Naeba is known as the 'St Moritz of the East', (or 'the Aspen of Japan' to North Americans) and is home of the largest ski resort hotel in the world - the 4000 room Prince hotel, which dominates and indeed owns the resort. Yuzawa, the nearest town, is the traditional capital of Japan's snowy region. It can be reached in 80 minutes by bullet train from Tokyo. Naeba has staged numerous World Cup and national ski races over the past 30 years and annually tops 2,500,000 skier visits. For the 2000-01 season a new gondola connecting Naeba Resort and Kagura Tashiro resort in Yuzawa Town, both of which are owned by the Prince Hotel group, Kokudo (http://www.princehotels.co.jp) was opened. The gondola is 5,481 meters (around 3.5 miles) in length - over 500 meters longer than the previous longest in the world in France (Val Thorens, 4942m), holds up to eight people, has a highest speed of six meters per second, and have a difference of 424 meters from it's lowest to highest point. 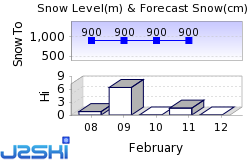 The next notable snow forecast for Naeba is 5cm2in, expected on 27 April, with around 5cm2in forecast over the next 7 days. The Japanese Ski Resort of Naeba is one of the larger Ski Resorts in Japan and has direct access to 43km27 miles of downhill skiing, served by a total of 29 ski lifts. The longest possible descent in Naeba is 4km2 miles long. Naeba offers good sking, particularly, for Intermediate and Beginner skiers. One Make and Rail Slide also available and boarders welcome on the slopes. We don't currently have confirmed season dates for Naeba. Usual opening is late November, and usual closing is Late May. NOTE:- Lift and Piste openings are always subject to Snow Conditions in Naeba. The 29 ski lifts of Naeba are able to uplift 50,000 skiers and snowboarders every hour. Naeba is in the Japanese Alps in Niigata, Japan. The nearest airport to Naeba is Niigata which is 161 minutes drive away. Other popular Ski Areas near Naeba. Want to ask about skiing and snowboarding in Naeba? Or contact Naeba Tourist Office. Note :- The information on J2Ski concerning Naeba, where not clearly factual, is opinion only and is neither definitive or exhaustive.